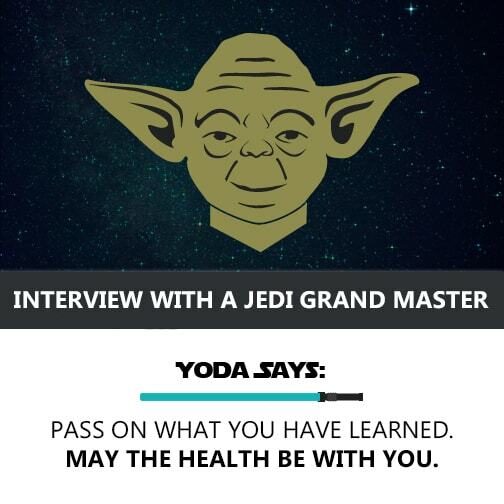 The wise little green guy in Star Wars said it best, “pass on what you have learned”. Our Medical Center & Spa for alternative medicine in Puerto Vallarta, Mexico is firmly grounded in this principle of education in the ways of nature as a means of self-healing. As the hype for the new Star Wars: The Force Awakens movie rises, we thought it would be cool to feature some truths about alternative medicine in Mexico that we learn from the Star Wars saga. Sounds interesting? Keep on reading! There is an ancient truth mastered by oriental cultures that converges on the roots of our physical make up: nature as our means of existence. In the sci-fi movie, Master Yoda represents that truth iconically. The practice of medicine had it’s roots nested in this belief of “nature as thy medicine”. In fact, the very word “doctor” comes from Latin doctor ‘teacher’ (from docere ‘teach’). So the entire practice of medicine itself was created to teach people how to heal themselves. That is what Holistic Bio Spa was born for: for helping others to return to the building blocks of their health and well-being — nature. how it can benefit every day of your life. First, What is Holistic Medicine? In its truest sense, holistic medicine is a practice philosophy of medicine that focuses on healing the whole person, more than merely the sum of its body parts. The first focuses on identifying the root cause of your ailment (from headaches and the common cold to cancer and chronic fatigue). The second purges your body of toxins and pathogens causing imbalances and sickness. The third places greater emphasis on “building the new” now that the old is gone – by inculcating and personalizing good healthy habits to maintain this state of well-being. Sounds amazingly simple? It is! Dozens of famous (and sensible) celebrities in the Europe and the United States are opting for holistic and alternative medicine therapies and practices to cure the “incurable”. Other such dabblings in natural medicine include curing diseases such as cancer, fibromyalgia, multiple sclerosis, panic attacks, and organ failure. Don’t believe us? Ask what benefits Dr. Oz receives from alternative medicine. Read about Hollywood celebrities who “went pro holistic” here: Oprah Winfrey, Gwyneth Paltrow, Princess Diana (our sweetheart), Elle Macpherson, Nick Nolte, and Dr. Andrew Weil (our favorite). Subscribe to our blog to learn the benefits of Holistic Alternative Medicine in the next post! Are you pro treating your health the same way you have been for years, or are you thinking that a better approach is needed to improve your life? 2 Responses to "Alternative Medicine 101: Truths We Learn From Star Wars – Part 1"
So the question is,… if doctors are open and willing to learn about alternative medicine to treat cancer, and their patients are turning to non-conventional cancer treatments…why isn t more education recommended to oncologists? Thank you for the open-ended question, Julia. It is true that patients and medical doctors are turning to medical alternatives for cancer in Mexico and the world over. For the sake of argument, and in a spirit of understanding and compassion, I believe the reason why such effective medical alternatives are not advocated is because there isn’t as much financial gain from natural remedies. Most doctors are forged in a system where pharmaceuticals are the big push. This industry has gained momentum and mass wealth. Fortunately, I personally have met many doctors who have turned their efforts to natural, holistic, and integrative remedies with much success. Chek out our video testimonial of Mario, who was cured of bladder cancer in Puerto Vallarta, MX.